Our research team has been involved in basic cell biology studies related to connexin assembly and gap junction turnover since 1992. 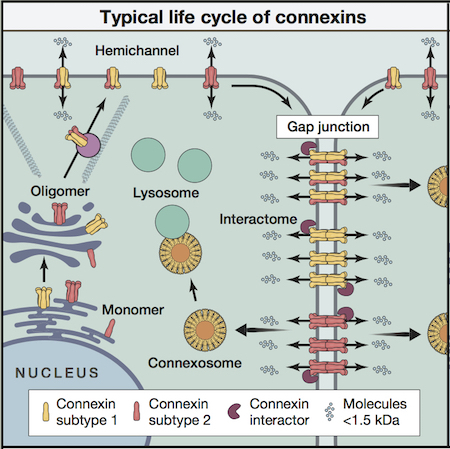 The importance of examining the mechanisms, events and pathways related to the life cycle of connexins is highlighted by the fact that connexins have a short half-life of 3 hours or less, strongly suggesting that the extent of gap junctional intercellular communication can be exquisitely regulated by channel formation and removal. To facilitate these studies, we have developed several strategies to examine connexin transport, assembly and degradation in living cells using a variety of fluorescent protein tags and time-lapse imaging techniques that are suitable for analysis on a Zeiss LSM 800 AiryScan, high-resolution confocal microscope. These approaches allow for one, two or three fluorescently-tagged connexins or associated molecules to be simultaneously followed within a single cell or colony of cells (see example). We are also interested in pioneering new imaging processes that will allow quantitative analysis of connexin movements within cells. Together with molecular interventions using dominant-negative construct expression, siRNA gene knockdown approaches and CRISPR-Cas9 gene ablation, key transport or assembly specific molecules can be examined for their role in regulating the life cycle of connexins in normal and diseased cells. Functional cell-cell communication is routinely quantified by the microinjection or pre-loading of small fluorescent dyes that are capable of passing from one cell to another through gap junctions. More analytical analysis of gap junction channel function is done in collaboration with our neighbour, Dr. Donglin Bai, who is an expert in dual patch clamp analysis. Together these studies are designed to investigate the role connexin assembly and turnover play in regulating the levels of cell-cell communication in response to physiological stimuli. D. Xiao, S. Chen, Q. Shao, J. Chen, K. Bijian, D.W. Laird and M.A. Alaoui-Jamali (2014) “Dynamin 2 interacts with connexin 26 to regulate its degradation and function in gap junction formation” International Journal of Biochemistry and Cell Biology 55: 288-297. D.W. Laird (2010) “The gap junction proteome and its relationship to disease” Trends in Cell Biology 20: 92-101.